We can finally put an official number on the apps in the Android Marketplace: 30,000. That's more than double what was available in December, a crazy fast rate of growth. And they're going to need to keep it up. The numbers come from straight from Google via MobileCrunch, while the Apple App Store had 150,000 apps as of their iPad pre-order announcement earlier this month. So although the Android Marketplace's expansion is impressive, they're still outnumbered a 5:1. At least. Of course, Apple had a head start. 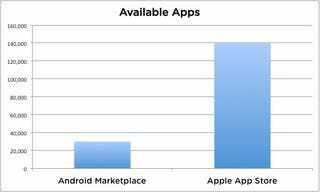 And to Android's credit, they've got a much higher ratio of free to paid apps than the App Store does. But app quantity is a huge advantage in the mobile OS wars. And even more important is quality, in which Android's also been lacking of late. While both stores have their share of filler, apps that show up in both the Android Marketplace and the App Store have generally been better on the latter. There are obviously exceptions, but it's a recurring theme.